Franco-Tabares, Sebastian / Stenport, Victoria Franke / Hjalmarsson, Lars / Tam, Pui Lam / Johansson, Carina B. Purpose: To investigate direct bonding of a 10-MDP-based cement to two novel translucent yttria-stabilized tetragonal zirconia polycrystal ceramics (4Y-TZP, 5Y-TZP) and observe the influence of thermocycling on this bonding. Materials and Methods: Powders of presintered and isostatically pressed 5Y-TZP, 4Y-TZP and 3Y-TZP were mixed with a 10-MDP-based cement (Panavia F 2.0), then stored in deionized water for 48 h at 37°C or thermocycled 10,000 times. Raman spectroscopy and Fourier-transform infrared spectroscopy were used to assess the presence of a functional group (PO32-) that could indicate bonding before and after thermocycling. X-ray photoelectron spectroscopy was used to identify the presence of the suspected Zr-O-P bond in the same specimens. A shear-bond strength (SBS) test was conducted based on ISO 29022:2013. Results: Marked peaks assigned to the asymmetric vibrations of the PO32- functional group were observed in both zirconias before and after thermocycling. The binding energy corresponding to Zr-O-P interactions (531.5 eV) was masked by the aluminosilicate in the filler of the cement. Shear bond strengths were approximately 20 MPa after water storage and approximately 6 MPa after thermocycling. No differences were found between the control group and the translucent zirconias. Conclusion: Direct bonding of the 10-MDP-based cement to both 4Y-TZP and 5Y-TZP was highly plausible. Both 4Y-TZP and 5Y-TZP may be promising alternatives to glass-ceramic restorations. Do Universal Adhesives Benefit from an Extra Bonding Layer? Purpose: Universal adhesives use a combined primer/bonding resin applied either in 2-step etch-and-rinse (2-E&R) or 1-step self-etch (1-SE) mode. This study investigated whether three universal adhesives would benefit from an extra bonding layer (EBL), essentially making them 3-step E&R (3-E&R) and 2-SE adhesives, respectively. Materials and Methods: Microtensile bond strengths (μTBSs) to bur-cut dentin of Clearfil Universal Bond Quick (C-UBq, Kuraray Noritake), G-Premio Bond (G-PrB, GC) and Prime&Bond Active (P&Ba, Dentsply Sirona) were compared to those of the 2-SEa Clearfil SE Bond 2 (C-SE2, Kuraray Noritake) which was also employed in 3-E&R mode. A split-tooth design was applied with each adhesive used in E&R and SE mode on each tooth, half without/with EBL (C-SE2 Bond). All adhesives were light cured after application of the final layer. The μTBS of one-third of the specimens was measured after 1-month water storage without thermocycling (TC), with the remaining two-thirds aged with 25,000 and 50,000 TCs. All μTBSs were statistically analyzed using a linear mixed-effects model with specific contrasts (p < 0.05). Results: Overall, the four variables (adhesive, bonding mode, EBL, aging) significantly influenced μTBS. Solely G-PrB benefited from EBL when applied in SE mode. In E&R mode, P&Ba generally resulted in the highest µTBSs, C-UBq presented with intermediate and G-PrB with the lowest µTBSs, where the latter was significantly lower than the µTBSs recorded for C-SE2. In SE mode, P&Ba generally resulted in the highest µTBSs in 1- and 2-SE mode. Equally high µTBSs were recorded for G-PrB in 2-SE mode with EBL. Lower µTBSs were recorded for G-PrB in 1-SE mode and for C-UBq in 1- and 2-SE mode. Conclusion: The overall effect of EBL on immediate and aged bonding efficacy depended on the specific universal adhesive and its bonding mode. Purpose: To determine the degree of conversion (DC), physicochemical properties, and microshear bond strength (µSBS) of experimental self-adhesive resin cements (SARCs) to dentin and yttria-stabilized tetragonal zirconia polycrystal (Y-TZP) ceramic. Materials and Methods: Dual-curing cements were formulated with UDMA, HEMA, bis-GMA, and TEG-DMA as the organic matrix. 2MP (bis 2-(methacryloyloxy)-ethyl-phosphate) and GDMAP (1,3-glycerol dimethacrylate phosphate) were added to impart self-adhesive characteristics. A control group was formulated without self-etch methacrylates. Silanized particles were incorporated. Photoactivation was carried out using an LED light-curing unit (1200 mW/cm2) for 20 s. Infrared spectroscopy assessed the DC immediately and after 24 h. pH was analyzed in real time and recorded after 48 h. Water sorption (Wsp), water solubility (Wsl), and film thickness measurements followed ISO 4049. µSBS of the cements to dentin and Y-TZP was evaluated immediately and after 3 months of water storage. Y-TZP was also tested without a surface treatment and after tribochemical silica coating with subsequent application of a silane agent. The fractures patterns were classified as adhesive, cohesive, and mixed. Data were submitted to analyses of variance and Tukey's tests (α = 0.05). Results: Control (91.7%) and 2MP (92.0%) groups generated the highest DC after 24 h. 2MP (pH = 3.6) showed the lowest pH followed by GDMAP (pH = 4.7) and control (pH = 6.4) after 48 h. The control cement exhibited lower Wsp (41.0 µg/mm3) and Wsl (4.3 µg/mm3) than the other groups. Film thickness was statistically similar (p = 0.266) for all cements. Control (27.0 MPa) and GDMAP (24.1 MPa) showed higher µSBS to dentin than 2MP (13.7 MPa) after water storage. Mixed fractures were predominant in dentin. For all cements, the µSBS to Y-TZP was < 3.0 MPa after water storage, independent of the surface treatment. Conclusion: The results of DC, pH, Wsp and Wsl were material dependent. Only the film thickness was statistically similar for all groups. The cement formulated with GDMAP maintained the bond strengths to dentin even after aging. However, none of the groups were able to generate satisfactory bond strength to Y-TZP, independent of the surface treatment. Purpose: To determine the effects of two different sterilization methods on the pull-out bond strength, flexural strength, and elastic modulus of glass-fiber posts. Materials and Methods: A total of 69 glass-fiber posts were used. The posts were divided into three groups according to applied sterilization method: 1) control, 2) ethylene oxide gas (EOG), and 3) autoclave. The microstructure of three posts from each group was evaluated by SEM and energy-dispersive X-ray spectroscopy (EDS). Thirty glass-fiber posts were used to evaluate pull-out bond strength. The three-point bending test was performed to analyze the flexural strength on another 30 glass-fiber posts. Failure modes were categorized microscopically after the pull-out test. After the three-point bending test, micromorphology at the bending area was examined using SEM. Results: One-way ANOVA indicated no statistically significant differences among the group means in terms of bond strength (p > 0.05), flexural strength (p > 0.05), or elastic modulus (p > 0.05). EDS revealed that the weight percentage of surface oxygen atoms in the EOG- and autoclave-sterilization groups were significantly higher. SEM images were similar. Conclusion: The results of this study show that glass-fiber posts can be sterilized either by autoclave or EOG when necessary, without any negative effect on bond strength, flexural strength, or elastic modulus. Siqueira, Fabiana Suelen Figueredo de / Hilgemberg, Bruna / Araujo, Lucila Cristina Rodrigues / Hass, Viviane / Bandeca, Matheus Coelho / Reis, Alessandra / Gomes, João Carlos / Cardenas, Andres Felipe Millan / Loguercio, Alessandro D.
Purpose: To evaluate the effect of two phosphoric acids containing protease inactivators (chlorhexidine and proanthocyanidin) on the resin/eroded-dentin microtensile bond strength (μTBS), nanoleakage (NL), and in situ degree of conversion (DC) of three universal adhesives applied in the etch-and-rinse mode. Materials and Methods: One hundred twenty-six molars were randomly assigned to 18 experimental conditions according to the combination of the independent variables: eroded dentin (soft drink and citric acid), adhesive (Prime&Bond Elect [PBE, Dentsply Sirona], Scotchbond Universal Adhesive [SBU, 3M Oral Care], and Tetric N-Bond Universal [TEU, Ivoclar Vivadent]), and acid pretreatment (conventional phosphoric acid [CP acid]; chlorhexidine acid [CHX acid]; and proanthocyanidin acid [PA acid]). After restorations, specimens were sectioned into resin-dentin sticks (ca 0.8 mm2) that were then tested under tension (crosshead speed: 0.5 mm/min). Selected sticks from each tooth were used to evaluate NL and DC. Data from all tests were subjected to three-way ANOVA and Tukey's test (α=0.05). Results: Dentin eroded with citric acid showed a significant reduction in μTBS for each adhesive in comparison to dentin eroded with the soft drink (p < 0.001). For dentin eroded with CHX acid and PA acid, the μTBS (p > 0.03) significantly improved and NL decreased for all adhesives (p < 0.004); in addition, the DC improved for two of the three adhesives tested (SBU and TEU) (p < 0.03) when CHX acid and PA acid were compared to CP acid. Conclusion: The addition of chlorhexidine and proanthocyanidin to phosphoric acid improved the adhesive performance when compared with conventional phosphoric acid, without jeopardizing adhesive polymerization at the resin/eroded-dentin interface. Purpose: To examine the effect of grape seed extract (GSE) pretreatment on the reduction of active gelatinases when using universal adhesives in etch-and-rinse mode. Materials and Methods: Fifty extracted non-carious human teeth were used in this study. Dentin powder was prepared for analysis of active MMP-2 by ELISA. Resin-dentin slices were prepared for in situ zymography in order to localize active gelatinases by quenched fluorescein-conjugated gelatin under a confocal microscope. Fluorescence intensity was analyzed quantitatively. Specimens were allocated into 6 groups: a non-treated control, phosphoric acid etched (PA), PA followed by Single Bond Universal (SBU, 3M Oral Care) or G-Premio Bond (GPB, GC), and PA followed by GSE for 1 min prior to SBU or GPB. The data were analyzed with one-way ANOVA and Bonferroni's test at a significance level of 0.05. Results: Application of the universal adhesives SBU and GPB in etch-and-rinse mode reduced active MMP-2 in dentin matrices. However, the only further significant reduction was found in GPB pre-treated with GSE, as analyzed by ELISA. In situ zymography demonstrated the location of active gelatinases, and fluorescence intensity analysis confirmed significant reduction of active gelatinases in the hybrid layer of GPB pre-teated with GSE compared to GPB alone. Conclusion: The present study demonstrated the potential advantage of applying GSE to reduce active gelatinases especially at the hybrid layer, with greater benefit achieved for hydrophobic adhesives. Nevertheless, the mechanism of action, analysis of bond strength, and long-term efficacy require further study. Purpose: To evaluate the effect of in-office bleaching on enamel microshear bond strength (µSBS) of two self-etch adhesives (SEA). Materials and Methods: For the bleaching group, bovine enamel surfaces were treated with a bleaching agent and divided into two main groups: one in which adhesive was applied immediately after bleaching and another in which adhesive was applied after one week. Enamel was bonded using the following procedures: group 1: application of a two-step SEA (Clearfil SE Bond 2, SE2, Kuraray Noritake); group 2: etching with 40% phosphoric acid (PA) and application of SE2;.group 3: application of a one-step SEA (G-Premio Bond, GP, GC); group 4: etching with PA and application of GP. Resin composite was placed and µSBS was measured at 24 h (immediately) and 1 week after bleaching. Acid-base resistant zones (ABRZ) were observed under SEM. Three-way ANOVA was used for data analysis. Results: Bleaching significantly decreased the µSBSs even after PA etching with both SE2 and GP (p ≤ 0.005). However, there were no significant differences in µSBS between groups with and without PA etching, except for SE2 without bleaching, in which the µSBS significantly increased with PA etching (p < 0.005). Thick ABRZs were found in SE2 and GP after bleaching, which exhibited an irregular wave-like shape for PA-treated specimens. Conclusion: The enamel µSBSs were adversely affected by in-office bleaching. Thick ABRZs were created with bleaching and PA treatment. Purpose: To measure microtensile bond strength (μTBS) of universal adhesives immediately and after 6-month aging, with or without an additional adhesive layer applied on a separately light-cured or non-light-cured universal adhesive. Materials and Methods: Eighty human third molars were randomly assigned to 8 experimental groups. The universal adhesives Clearfil Universal Bond (Kuraray Noritake) and Single Bond Universal (3M Oral Care) were used in self-etch mode (following the manufacturer's directions), and either light cured or not before application of an extra hydrophobic adhesive layer (Clearfil SE Bond bond, Kuraray Noritake). The two-step self-etch adhesives Clearfil SE Bond (Kuraray Noritake) and OptiBond XTR (Kerr) were used as references. After composite buildups were bonded to mid-coronal occlusal dentin surfaces, the specimens were stored in water (37°C/24 h) and sectioned into microspecimens (0.96 ± 0.04 mm2). Half of the specimens were immediately subjected to μTBS testing (1.0 mm/min), while the other half was stored in water (37°C) for 6 months prior to testing. Failure analysis was performed using stereomicroscopy and SEM. Data were analyzed with two-way repeated measures ANOVA, Tukey's and paired t-tests (p = 0.05). Results: The immediate μTBS was similar for the universal adhesives when applied following the different application strategies (p > 0.05). Application of an extra layer of hydrophobic adhesive improved the aged μTBS of the universal adhesives, which was statistically significant when the universal adhesives were first light cured (p < 0.05). 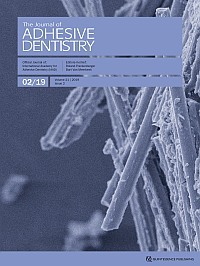 The reference adhesives Clearfil SE Bond and OptiBond XTR exhibited a significantly higher immediate and aged μTBS to dentin than did the universal adhesives (p < 0.05). Conclusion: The bond durability of universal adhesives, applied in self-etch mode, was found to benefit from the application of an extra hydrophobic adhesive layer when the universal adhesives were first light cured. #Worn_Dentition: The Adhesive Way - See you in Bologna!